British painter (1922–2011). Autograph letter signed. 32 St. John’s Wood Terrace. N.W. 8. [London]. 8vo. 2 pp. Printed letterhead. Pencil. 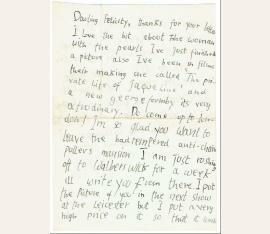 Love letter to Felicity Hellaby „Darling Felicity“ in Freud’s uneven hand: „thank you so much for your letter with the Kandinsky on the back. Have you got one of those moving beds with hot and cold water like Miss Law? I went to see a play called ,No Orchids for Miss blandish’ which is pretty amazing for the London stage. A wicked old woman sits in her horrible room which is supposed to be a den or lair and the walls are made like a spiders web. I might be moving to a rather delishiouse [!] place round the corner from here because Stephen can not work at his poems with the piano’s noise and I have got the only sound proof room in the flat but its rather uncertain yet. I am painting a portrait of a boy who won’t sit. He thinks he’s developed a neurosis about it. Lots of Love“. - Felicity Hellaby, his one-time girlfriend and fellow art student, who is also the subject of some of his earliest known paintings. 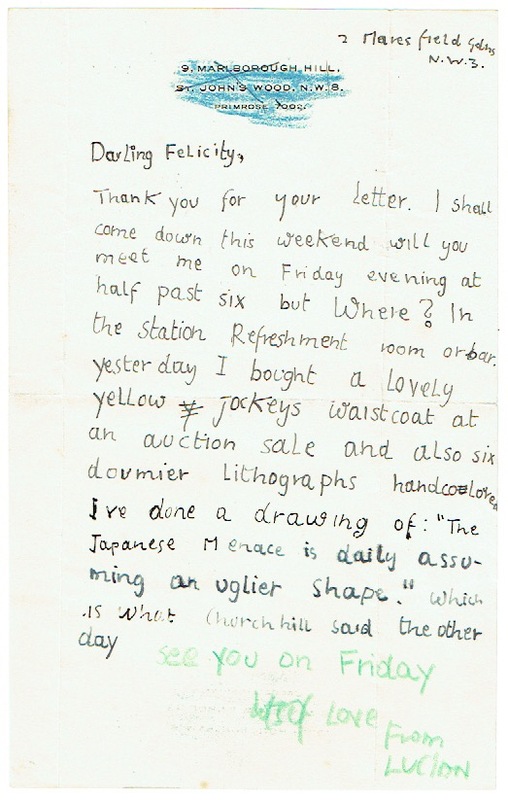 This letters shows a limited grasp of spelling with "delishious" among his more egregious mistakes..
British painter (1922–2011). Autograph letter signed. 3 Maresfield Fdns N.W.3. 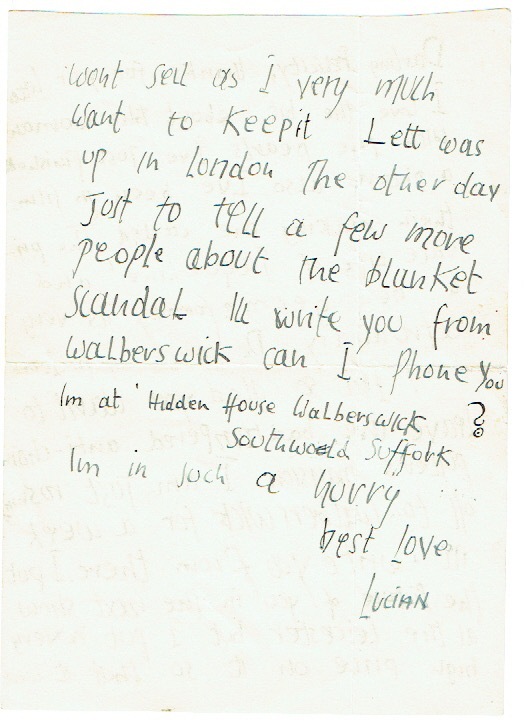 [address 9, Marlborough Hill crossed out by him in blue crayon]. 8vo. 1 p. Printed letterhead. 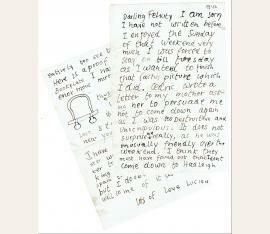 Love letter to Felicity Hellaby „Darling Felicity“ in Freud’s uneven hand: „Thank you for your letter. I shall come down this weekend. Will you meet me on Friday evening at half past six but Where? In the station Refreshment room or bar. Yesterday I bought a lovely yellow jockeys waistcoat at an auction sale and also six doumier [Honoré Daumier] lithographs handcolored. I’ve done a drawing of: ,The Japanese Menace is daily assuming an uglier shape.’ Which is what Churchhill [!] said the other day. “ - Felicity Hellaby, his one-time girlfriend and fellow art student, who is also the subject of some of his earliest known paintings. This letters shows a limited grasp of spelling with "Churchhill" among his more egregious mistakes..
British painter (1922–2011). Typed letter signed. 32 St. John’s Wood Terrace, London. 4to. 1 p. Printed letterhead. 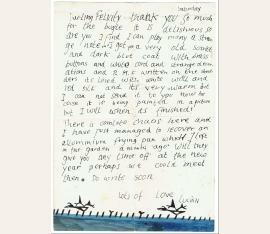 Love letter to Felicity Hellaby „Darling Felicity“: „I would love to come down this Weekend. 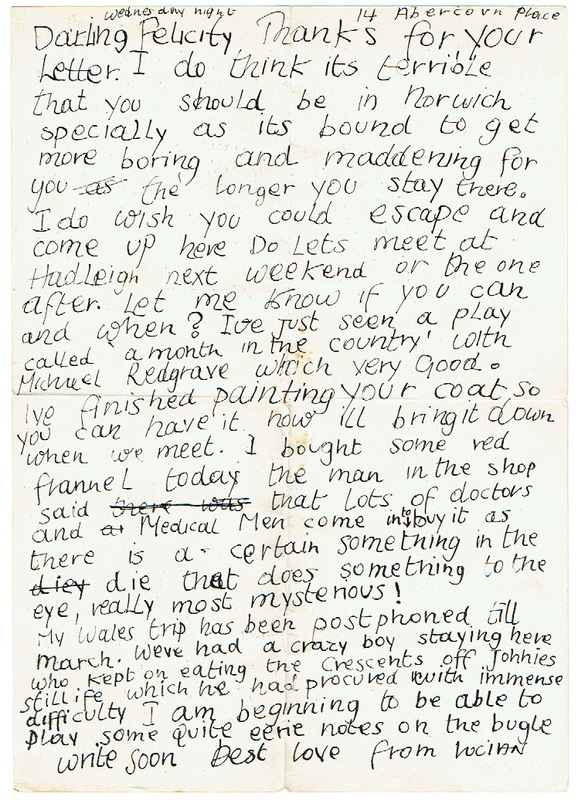 thanks very much for your letter I went to Brighton last monday To see some wonderull Picasso pictures that a man has. I went too the opening of that enormous exebition for Russia in portman sqare wich is rather awful, and saw many familiar faces including moudie, allan Waltan, algy newton and two old ladies of ninety, who said to one another ,what I REALLY like is pure spontanious enjoyment’! I have finished my piture of those birds and men, I might bring it down to show you. Jonnie Craxton and I are thinking of opening a new Russian barbers shop where you can get a timoshenko haricut sitting in one of timo’s saddles with cotton wool from turkistan in your ears, chewing some licorice roots from siberia. I bought some lovely postcards from victorian times where you pull leaversand people start doing acrobatics or change their clothes dis robe and change into witches flowers start sprowting babies and couples start having champangne dinners behind the hedge. I dont quite Know where I shall stay, it really depends what sort of mood they are in I might stay at the pub and if neccesary I could always stay in that rather nice haystack at the farm next door“. - Felicity Hellaby, his one-time girlfriend and fellow art student, who is also the subject of some of his earliest known paintings. 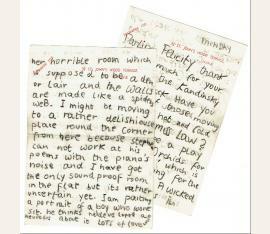 This letters shows a limited grasp of spelling with "spontanious" among his more egregious mistakes..
British painter (1922–2011). Autograph letter signed. 3 Maresfield Fdns N.W.3. 4to. 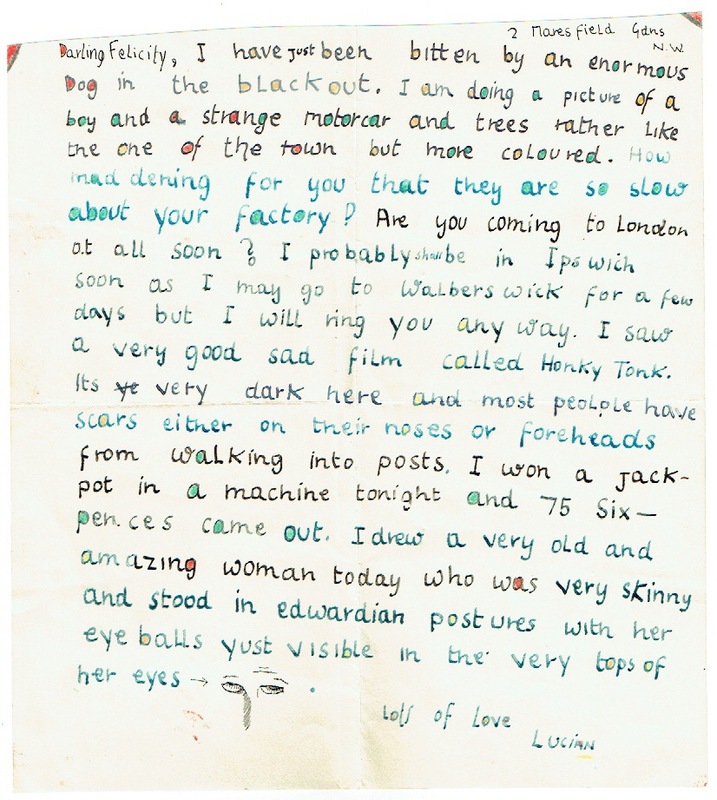 1 p.
Nicely hand coloured love letter to Felicity Hellaby „Darling Felicity“ in Freud’s uneven hand with a small sketch by Freud: „I have just been bitten by an enormous Dog in the blackout. I am doing a picture of a boy and a strange motorcar and trees rather like the one of the town but more coloured. How mad dening for you that they are so slow about your factory? Are you coming to London at all soon? I probably shall be in Ipswich soon as I may go to Walberseick for a few days but i will ring you any way. I saw a very good sad film called Honky Tonk. Its very dark here and most peolple have scars either on their noses or foreheads from walking into posts. I won a jackpot in a machine tonight and 75 Six-pences came out. I drew a very old and amazing woman today who was very skinny and stood in edwardian posture with her eyeballs yust visible in the very top of ther eyes [followed by a drawing of the eyeballs of the woman]“. - Felicity Hellaby, his one-time girlfriend and fellow art student, who is also the subject of some of his earliest known paintings..
British painter (1922–2011). Autograph letter signed. 14 Abercorn Place. 4to. 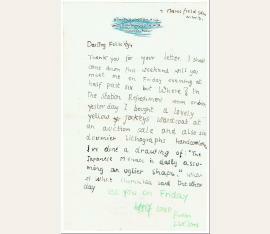 1 p.
Love letter to Felicity Hellaby „Darling Felicity“ in Freud’s uneven hand: „Thanks for your letter. I do think its terrible that you should be in Norwich specially as its bound to get more boring and maddening for you the longer you stay there. I do wish you could escape and come up here Do lets meet at Hadleigh next weekend or the one after. Let me know if you can and when? Ive just seen a play called ,a month in the country’ with Michael Redgrave which very good. Ive finished painting your coat so you can have it how ill bring it down when we meet. I bought some red flannel today the man in the shop said that lots of doctors and Medical Men come in to buy it as there is a certain somethiing in the die that does something to the eye, really most mysterious! My Wales trip has been postphoned till March. Weve had a crazy boy staying here who kept on eating the Crescents off […] I am beginning to be able to play some quite eerie notes on the bugle“. - Felicity Hellaby, his one-time girlfriend and fellow art student, who is also the subject of some of his earliest known paintings. 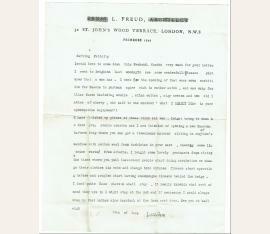 This letters shows a limited grasp of spelling with "postphoned" among his more egregious mistakes..
Love letter to Felicity Hellaby „Darling Felicity“ in Freud’s uneven hand with a small sketch of a man walking in the snow: „I am just rushing off to lunch to my Grandmother where the pekinese eats his three course dinner and coffee. Ive been distempering walls and ceilings and going for walks in the snow. That night I left you I went to Chelmsford and stayed in a very strange hotel wehere I had to give a password to get in and I gave the wrong one so they would not let me in but later I went back and gave the right one. They are playing a tune on the radio called ,Prairie Mary’. Is there any Ice scating in Norwich? I saw the Garbo film yesterday and before there was a wonderful film about a madman who lived in a shack with an old man with one eye who bullied him. It began by the madman being in the far corner of the room and the camera came nearer to him untill you saw the texture of his skin and then you saw his ear and by and by you saw right inside his ear where an awful banging noise was going on. Ill come down to norwich soon but Ill tell you when beforehand. Do send me some secret plans of some planes or machines“. - Felicity Hellaby, his one-time girlfriend and fellow art student, who is also the subject of some of his earliest known paintings..
British painter (1922–2011). Autograph letter signed. n. p. 8vo. 2 pp. Love letter to Felicity Hellaby „Darling Felicity“ in Freud’s uneven hand with a small sketch of a mirrow: „I am sorry I have not written before I enjoyed the Sunday of that weekend very much I was forced to stay on till tuesday as I wanted to finish that Cactus picture which I did. 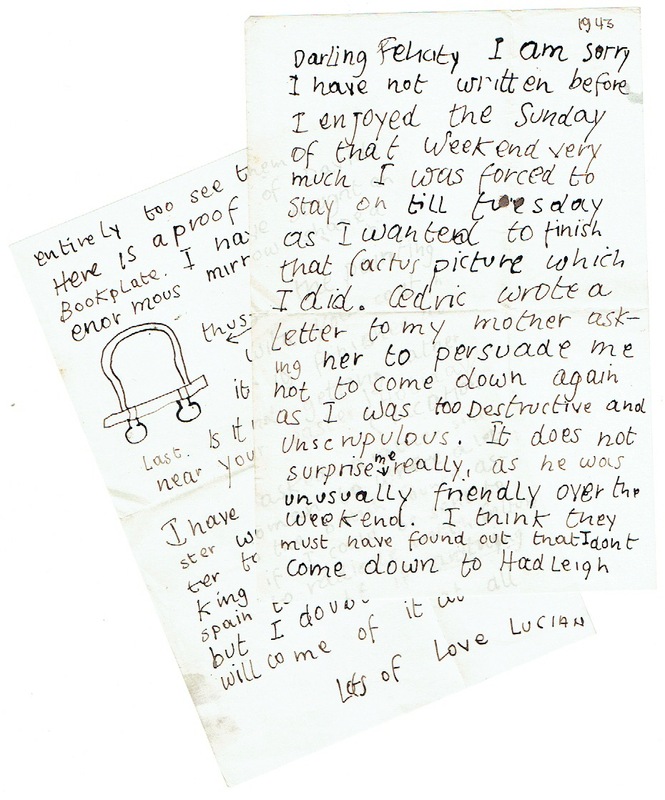 Cedric wrote a letter to my mother asking her to persuade me not to come down again as I was too Destructive and Unscrupulous. It does not surprise me really, as he was unusually friendly over the weekend. I think they must have found out that I dont come town to Hadleigh entirely too see them. Here is a proof of Davids Bookplate. I have bought an enormous mirrow shaped thus [followed by a sketch of the mirrow]. The pairoting with your coat in it is finished at last. Is it not getting rather near your easter Holiday vacation? I have asked a rather sinister woman to write a letter to the british Council asking if I could be sent to spain to radiate british Culture but I doubt if anything will come of it at all“. - Felicity Hellaby, his one-time girlfriend and fellow art student, who is also the subject of some of his earliest known paintings..
British painter (1922–2011). Autograph letter signed. n. p. 4to. 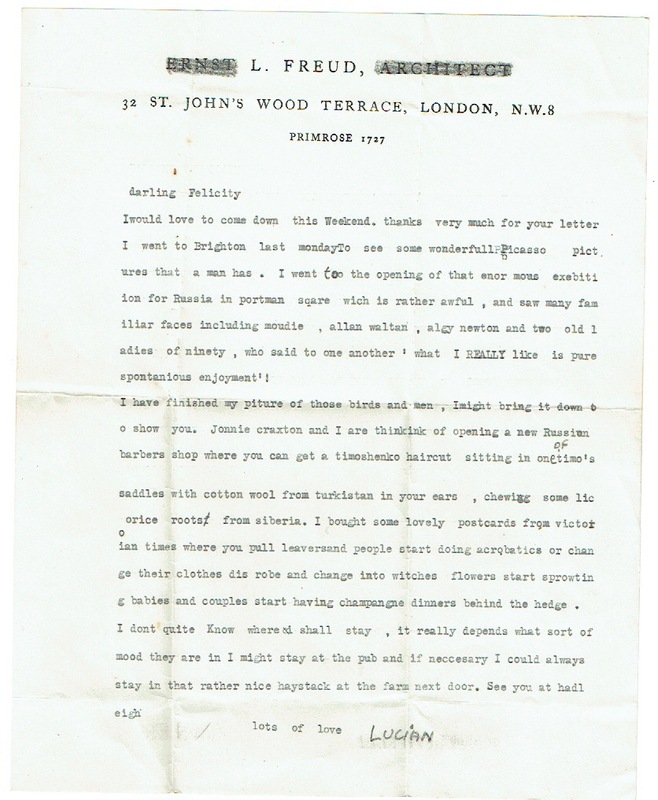 1 p.
Love letter to Felicity Hellaby „Darling Felicity“ in Freud’s uneven: „thank you so much for the bugle it is delishious so are you I find I can play many a strange note on it. 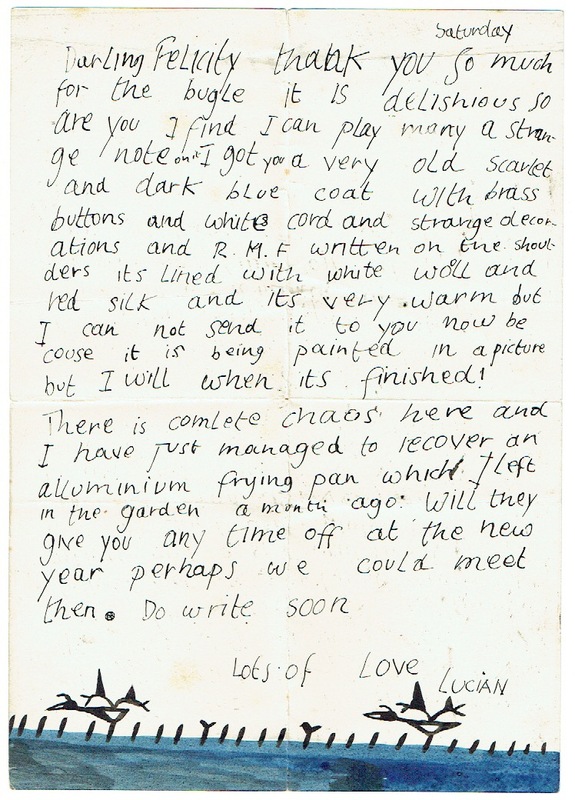 I got you a very old scarlet and dark blue coat with brass buttons and white cord and strange decorations and R.M.F. written on the shoulders its lined with white wooll and red silk and its very warm but I can not send it to you now be couse it is being painted in a picture but I will when its finished! There is complete chaos here and I have just managed to recover an alluminium frying pan which I left in the garden a month ago. Will they give you any time off at the new year perhaps we could meet then.“. - Felicity Hellaby, his one-time girlfriend and fellow art student, who is also the subject of some of his earliest known paintings. 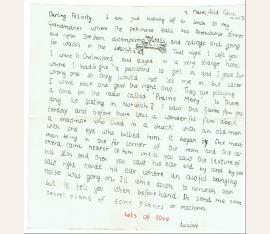 This letters shows a limited grasp of spelling with "Delishious" among his more egregious mistakes. - With a watercolour sketch of two birds flying over the sea..
Love letter to Felicity Hellaby „Darling Felicity“ in Freud’s uneven: „thanks for your letter I love the bit about the woman with the pearls I ve just finisched a picture also I ve been in films their making one calles ,The private life of Jaqueline’ and a new george formby its very extrodinary. Do come up to London! 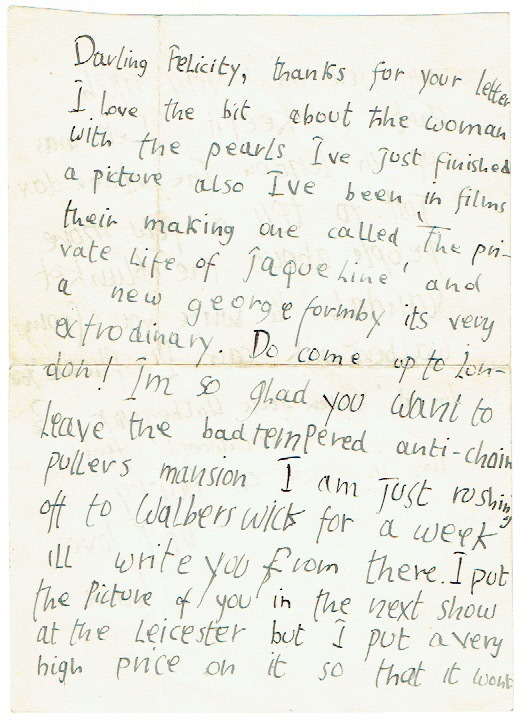 Im so glad you want to leave the bad tempered anti-chain pullers mansion I am just rushing off to Walberswick for a week Ill write you from there. I put the Picture of you in the next show at the Leicester but I put a very high price on it so that it wont wont sell as I very much want to keep it Lett was up in London the other day Just to tell a few more people about the blunket scandal Ill write you from Walberswick can I Phone you? “. - Felicity Hellaby, his one-time girlfriend and fellow art student, who is also the subject of some of his earliest known paintings..
British painter (1922–2011). Autograph letter signed „Love to you | from me“. n. p. Folio. 1 p. Pencil. 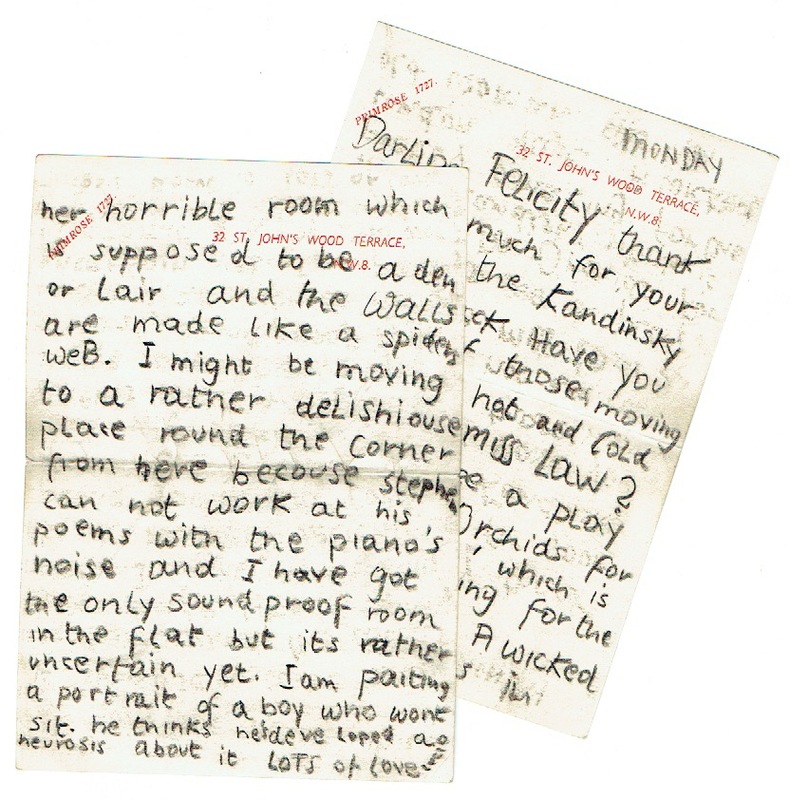 Love letter to Felicity Hellaby „Darling Felicity“ in Freud’s uneven: „I am sorry I have not written for so long to you though I have often meant to. I have been in Scotland and in Cornwall since I last saw you. Last week and I had a wonder full wavy bathe. rushing about england nearly makes me feel quite different but not quite. My Life is at a very crucial stage at the moment, one day I think I am beginning to make my work how I want it to be and than I feel so dissatisfied with it that I leave the house. I made a Lithograph in Ipswich of a horse and rumping fish by the sea. I have bought a very large Zebra’s head it looks very strange on the wall with big glass eyes and mane going up. By far the best thing I have every bought. Do come to London surely its your Autumn Holiday!“. - Felicity Hellaby, his one-time girlfriend and fellow art student, who is also the subject of some of his earliest known paintings. - Folded and some tears to the upper side..
British painter (1922–2011). Autograph letter signed. n. p. Folio (550 : 350 mm). 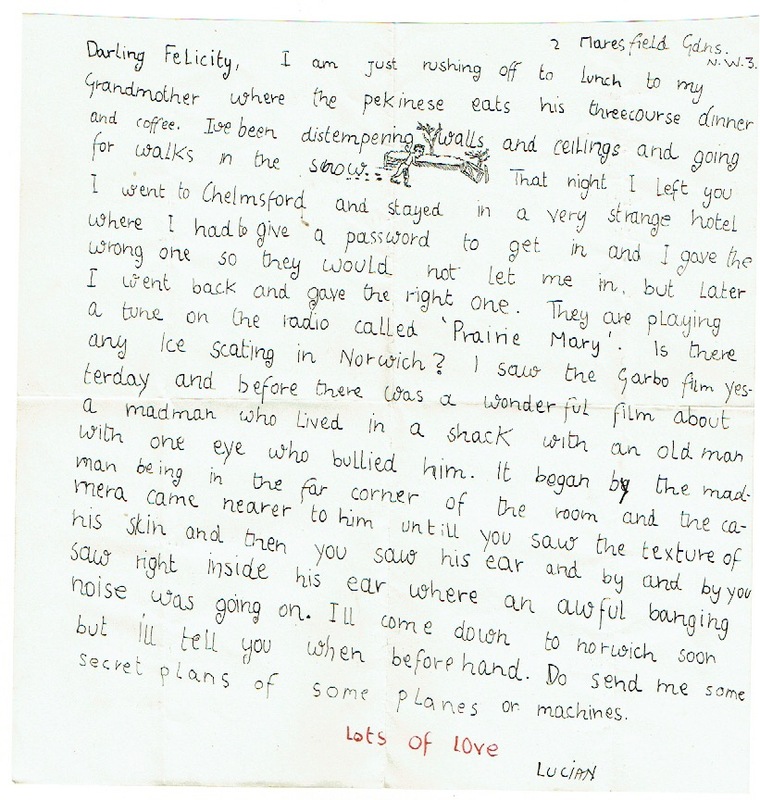 1 p.
Love letter to Felicity Hellaby „Darling Felicity“ in Freud’s uneven: „How are you? Thank you for your letter I ve just spilt a bottle of Indian ink over my sheets. I did enjoy seeing you in London even though I did not really get a chance to talk to you which I had wanted to probably because of the cold and everything being rather chaotic. I thought you were looking terifficaly glamerous. Do come up and stay for whitsun if you would like to. I am staying at a very creamy place. Every morning many parcels arrive each one contains a dead animal mostly chickens and Roosters gamecocks sometimes a rabbit once a byby Pig. I have been making pictures of them I did one of a gamecock in a bucket of hot scummy water and the fumes and smell of decay was so overwhelming that it sent me into a coma. These animals atract a special kind of fat blue and green fly they are terribly depraved and eat so much of the carcas that they go mad, buss slowly through the air in a dizzy manner and dive with a splash into my paint water where they die. I ve bought a stuffed deap sea fish with a beak and spikes all over it like a Cactus of which I ve done a picture. Allso I got a wonderfull book about Deseases of the skin with amazing illustration you must come and see it. Have you seen the Horzion with my things? I have been riding a great deal here it really is one of the most exiting things there is it makes me feel about three times more alive and powerfull than I do otherwise. I put some money on a horse in the two thousand Guinnies next tuesday called ,Pink Flower’ I may go to newmarket to see it run. I wish you could come along as well. Do write soon.“. - With some paper loss done by Freud. Tears. - Felicity Hellaby, his one-time girlfriend and fellow art student, who is also the subject of some of his earliest known paintings. - Folded and some tears to the upper side..
3 eigenh. Briefe mit U. („Dad“). Lucian Freud (1922–2011), painter. 3 autograph letters signed („Dad“). 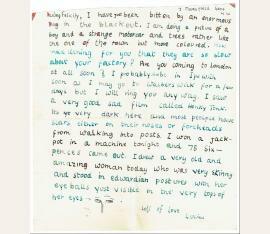 [London, 1974 and 1976]. Small 4to and 8vo. Altogether 5¾ pp. on 5 ff. With 3 autogr. envelopes. 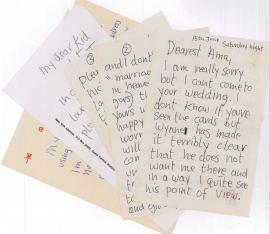 – To his daughter Annabel: „My dear Kidlet sorry about using your maidenly form of adress [!] Im not quite sure of nick’s other name. Hoping to see you around easter time [...]“. – „I am really sorry but I cant come to your wedding! I dont know if youve seen the cards but Wynne has made it terribly clear that he does not want me there and in a way I quite see his point of view. He does teach at Kings College and has arranged the whole thing and no doubt his friends and fellows will be there and I would be rather an outsider and so I had better stay outside [...]“ (June 15, n. y.). – Edges mostly frayed.